I have done a great deal of participant observation in playtesting/design processes in the development of new designs. 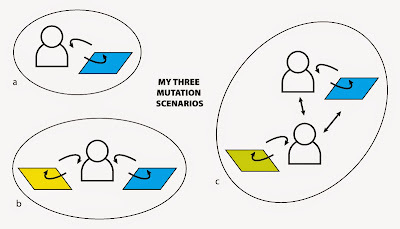 Over time I have observed three general ways that mutation occurs. I think that it is worthwhile to discuss these as it may be helpful to designers of all disciplines. There are no answers here. But, rather these perhaps can provide an interesting way to think about how we design. First, the most common way it seems that mutation occurs is as a designer works on a new design they draw from past experiences (figure b). 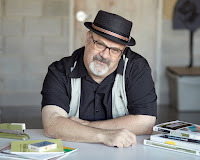 In this model a designer take ideas from artifacts and experiences that they have had in their past life and adapts them to the design at hand. This can in some cases be thought of as intuition. A designer perceives patterns in the project that they are working on that resemble patterns that they have see in other designs. The designer is able to adapt these old patterns to serve objectives and needs in the new design. Second, and perhaps the least common scenario happens in a sort of closed system between the designer and the project at hand (figure a). In this scenario the designer "grinds" on their design and perceives relationships and possibilities purely within their current design. The designer develops new ideas strictly as a result of seeing patterns, relationships and possibilities within the design at hand. This is a sort of "pure brute force" approach and it's possible that this scenario is extremely rare or even that it never truly happens. Is it possible to design without referencing our past experiences in some way? It seems impossible. But, I want to leave open the possibility that on rare occasions this sort of closed system designing does happen. 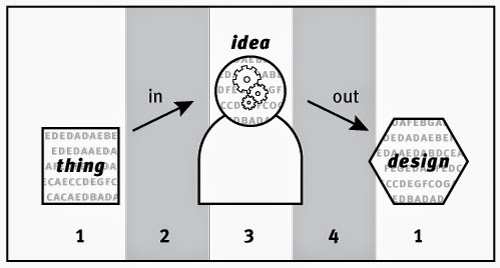 Third, and in my opinion the most powerful scenario, is when a designer is working with other people (figure c). These other people may be designers, playtesters, co-designers or simply some other types of acquaintances. In this model other people share their experience with the primary designer — feeding these ideas to the designer who applies these new ideas or together they find ways of applying past experiences and observations to the design at hand. Of course it is most common for there to be some combination of these three scenarios that happen during the creation of a new design. Earlier in my research I developed a very simple model that looked much like the second scenario (see below). The reason for using this model was manifold but one of the primary purposes was to position the design in the middle of an evolutionary process. The designer becomes a source of mutation as ideas move from artifact to design-mind and back to new artifact. This model should more accurately be extended (see below). This model is intended to illustrate how ideas move through artifact to design-mind, back to artifact and then to design-mind again. 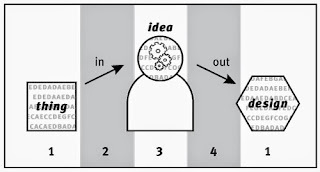 I think that this model shows how ideas evolve over time. If you look closely you'll see that I've added an ellipsis to left of the 1 on the left end and another to right of the 3 on the right end. This is meant to imply that the model repeats as ideas move through time and space. These two models that I have been using in the past seem to work fine but are limited to showing the process in a very fundamental way. After attending a protospiel last month I began thinking about the evolution process and came up with the three scenarios present at the beginning of this post. I think "figure a" and "figure c" are an interesting extension to my older models. One evening sometime in mid-March 2013 I was laying on the couch watching some worthless piece of television crap. My wife Vicki was siting in her chair at the end of couch playing sudoku or doing some such thing on her laptop. This had become our every evening. We'd come home from work, fix dinner, eat dinner and then "veg" for an hour or two before going to bed. She in her chair doing her thing... me on the couch doing my thing... day after day... week after week... month upon month. This had become the routine and it had been going on for a few years. It was slowly driving me crazy! I felt like we were alone together and I hated that feeling. Vicki loved games. Me... not so much. So, what happened that evening seemed extreme and shocking to me. Words came out of my mouth — something along the lines of, "let's go buy a couple of board games." 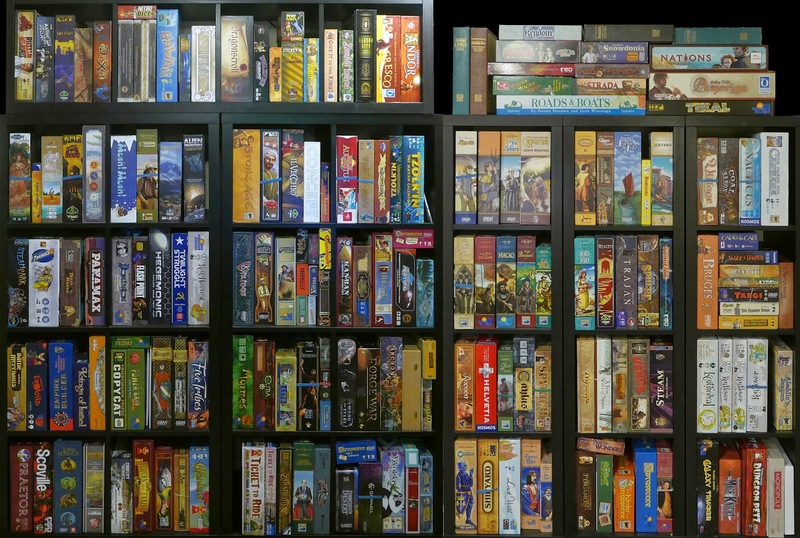 I was skeptical and apprehensive as we brought those first two games home, as we unboxed them, as we tried to understand the rules and play them. But, something kind of amazing happened as we played. Not only were Vicki and I no longer alone together — I saw wonderful things in those games. I was seeing complex systems in action, concept maps coming to life before my eyes, rich interaction and user experience. My relationship with Vicki was slowly and deeply being enhanced and my design brain was being fed a wonderful feast. 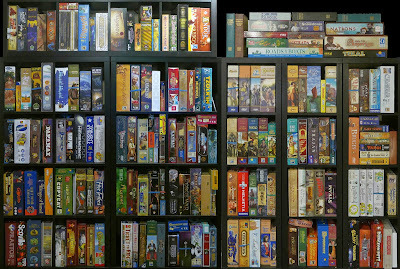 It's been over two years since my feet hit the path of board games and we now have a rather large collection of games (see the photo above). We play about six games a week — sometimes a few less and oftentimes many, many more. Modern board games are amazing and they have come to infect nearly ever part of my life. I'm not sure if there is some moral to the story here. I'm sure there are many. But I am also sure that I have a wonderful wife and we now share a deeply interesting hobby. In some ways we have become research partners as I have come to focus my work on how the designers of these games think and work. I hope it never ends.